Friedman Law Offices is proud to announce that after a 16-point analysis we are now accredited by the Better Business Bureau and received their prestigious “A” rating. Attorney Ari Friedman and Attorney Tova Friedman, specialize in Personal Injury Law, including all types of auto accidents, trip and fall, or any type of injury caused by the negligence of another party or entity. 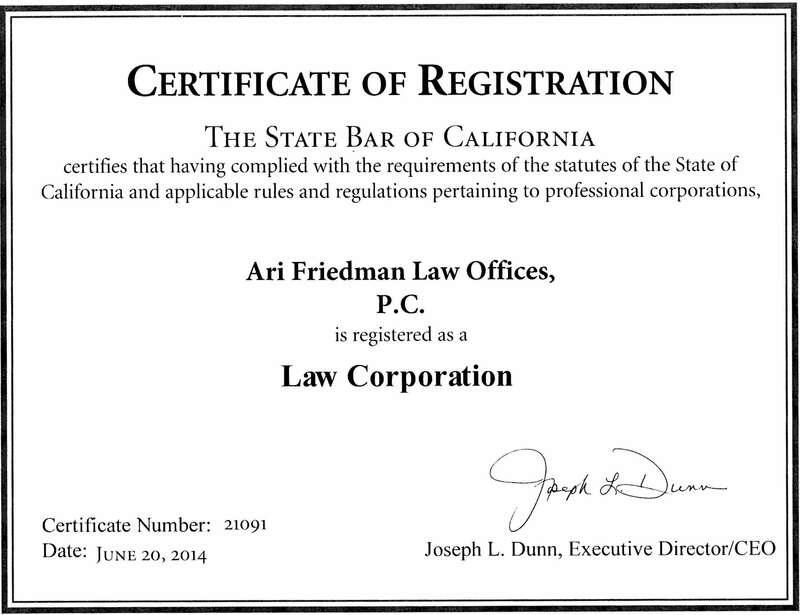 Ari Friedman Law Offices, P.C. 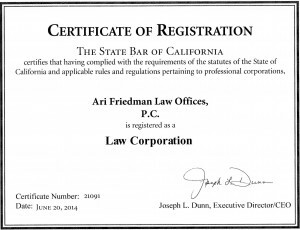 dba Friedman Law Offices, has met the high standards of the California State Bar and in addition to being eligible to practice as individuals, the law firm has been certified to practice law as a “Corporation” in the State of California. We “Personalize” Your Personal Injury Claim & Experience! Each client is treated with respect and courtesy. We ensure that every issue is addressed in a timely fashion. Ari Friedman and Tova Friedman offer you a unique experienced traditional practice that features new and vibrant techniques. This combination enables us to fight for you. At the Friedman Law Offices the client always comes first! Please check our testimonials. I Slipped And Fell. What Is My Remedy? Plaintiff was walking on Defendants’ property in order to pay for gasoline. Plaintiff tripped on a protruding piece of cement on Defendants’ property that was abutting a handicap ramp. Plaintiff tripped and fell face forward into the mini market’s cement wall. Plaintiff injured his shoulder, head, wrist, knees, back, neck, nose, lips, chest. As a result, Plaintiff received immediate emergency treatment and has been undergoing treatment since the accident with constant residual pain. Plaintiff parked his car in order to pay for gasoline at the gas station window. After exiting his car, he walked toward the pay window and tripped on the abutting cement. The ramp had no railing that most handicap ramps have. There were no warning signs advising of the abutting cement. The cement ramp came to an abrupt point and is located in a place where people walk from their car to the market. After arriving at the emergency room, Plaintiff was examined and given medication for pain. Plaintiff underwent a series of CT scans and x-rays and was ultimately admitted to the hospital, where he stayed for almost a week. The x-ray at the hospital indicated a “humeral neck fracture”. Plaintiff’s shoulder was secured by a shoulder immobilizer. Plaintiff was seen at the hospital by his primary care physician. Plaintiff had swelling from his shoulder through his forearm. The doctor advised Plaintiff that he must continue to wear the shoulder immobilizer. Plaintiff still experiences constant head pain, constant right shoulder pain that radiates to his back, and constant hip pain. Plaintiff experiences intermittent pain to both his knees. Plaintiff also still experiences almost constant pain in his neck. Plaintiff is no longer able to perform the normal housework or errands which require carrying heavy items. Before the accident, Plaintiff, an elderly gentleman, was able to maintain his home without the need of anyone’s help. Due to the accident, Plaintiff was forced to hire a housekeeper. Plaintiff cannot accomplish simple household tasks such as making his bed or cleaning the bathroom. An owner who conducts active operations on the premises must exercise ordinary care for the safety of everyone she knows, or should expect, to be on the property. Oettinger v Stewart, 24 C2d 133, 138 (1944). THIS CASE WAS SETTLED OUT OF COURT, AND THE CLIENT GOT THE MONEY THEY DESERVED!